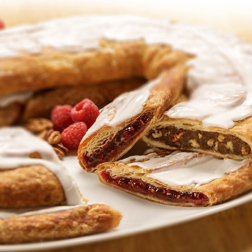 Send your very best wishes with our Kringle Stick Sampler Gift Box. We've combined our four most popular flavors - Pecan, Almond, Raspberry, and Apple-Cinnamon. Each 10.5oz. 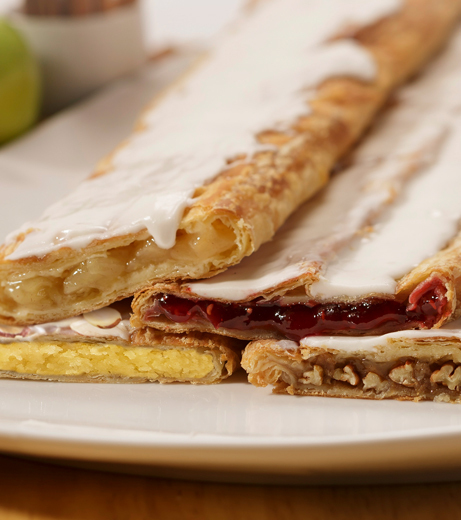 Kringle Stick is individually packaged, just right for a wonderful family or office gift. Sorry, no flavor substitutions. Sugar, margarine (interesterified soybean oil, water, salt, mono- and diglycerides, colored with annatto/turmeric. Calcium disodium edta preservative. Artificial butter flavor. Vitamin a palmitate added. ), wheat flour, eggs, apricot kernels, contains less than 2 % of each of the following: liquid sugar (sugar, water), almonds, salt, soy protein, yeast, corn syrup, dextrose, corn starch, calcium carbonate, maltodextrin, tocopherols preservative, calcium propionate preservative, agar-agar, natural and artificial flavors, malted barley, soy lecithin, potassium sorbate preservative, xanthan gum, color added.